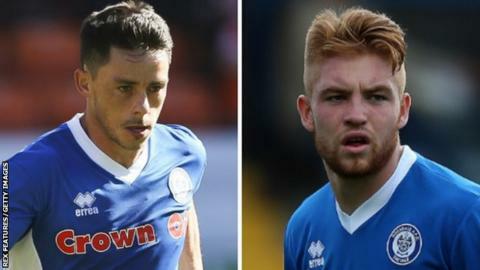 Rochdale striker Ian Henderson and midfielder Callum Camps have signed new contracts with the League One side. Former Norwich trainee Henderson, 30, has agreed a two-year deal until 2018 and has confirmed he will end his playing career at Spotland. Northern Ireland youth international Camps, 19, has signed a one-year extension until 2017. "I'm really pleased because we have to do things a certain way," Dale boss Keith Hill told the club website. Henderson: "I think I've found my home and I'm going to retire at Rochdale. I'm going to see out my playing career here because I love the place so much." Camps: "I'm enjoying my football and I enjoy it here at the club. It's a good environment and I feel as though I'm developing as a player and as a person." "We're doing it by trying to develop within our environment and by retaining players like Ian Henderson and developing players like Callum Camps. "Retaining these two players, who are at different spectrums of their career, is a magnificent achievement for the football club. "I'm just really pleased that Callum and Ian have decided to continue on the journey - I believe with that type of signing that it'll be a very successful journey."